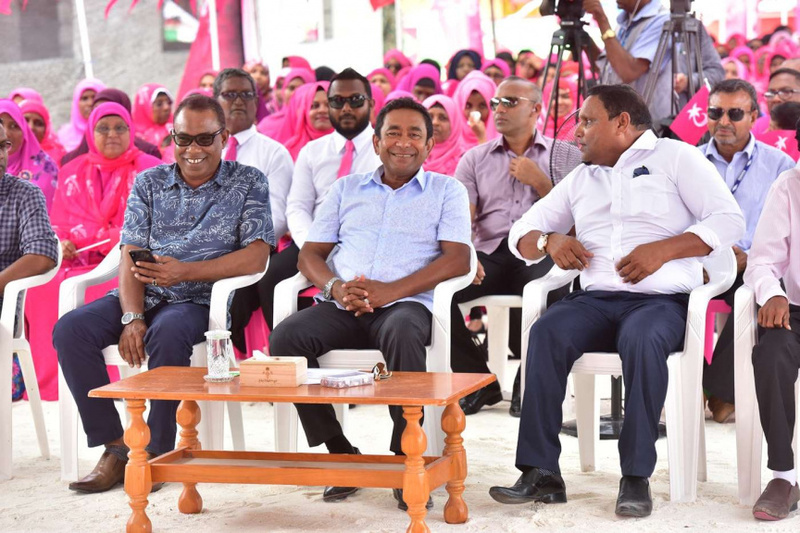 The 12 lawmakers who jumped ship and left ruling Progressive Party of Maldives (PPM) will be powerless with the opposition, says President Abdulla Yameen Abdul Gayoom. Speaking at a function held at R. Innamaadhoo this Tuesday morning, Yameen said the 12 lawmakers will not be as well received by another other political party as they were received by PPM. He said that those who jumped from his ship and climbed on board the opposition’s ship were “unlikely to even receive a bucket to remove water” from the ship. “They will be there onboard but they will be powerless,” said Yameen. He said the 12 lawmakers turned their backs on the right by leaving PPM, and that it was therefore only right they were disqualified from their parliamentary seats. He said the 12 lawmakers will need to win back their seats on their own. During his speech, Yameen said most politicians were selfish would paint whatever color they needed to in order to fulfil their selfish desires. “It doesn’t matter if yellow and red never mix. They will mix yellow and red. The talk of how many such politicians have we listened to? No true believer will be stung twice from the same pit. How any such true believers are there among politicians now?” said Yameen. He said there were several politicians who return even after being stung at the same pit more than twice. Yameen said other members of the opposition coalition were powerless except for Maldivian Democratic Party (MDP). Yameen also criticized the recent decree passed by MDP to recover assets allegedly stolen by his administration. He said the opposition did not have to do anything to recover the assets, and would not be able to find any stolen assets. “Because the most assets stolen are associated with them. The most assets were stolen during their administration. The only thing they know to do is to either sell or lease assets,” said Yameen. He asked the people to re-elect him for a second term during the Presidential Elections 2018, scheduled to be held on September 23.